It is important to change the basic Wi-Fi settings on your router in order to establish a unique and secure connection. A protected Wi-Fi prevents unwanted access to personal information. The changes you can do include assigning a Wi-Fi name and securing your connection through a Wi-Fi password. The Wi-Fi password is NOT the router password. 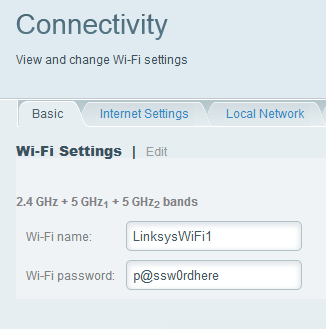 To learn how to check and update the router password using your Linksys cloud account, click here. Changing your Wi-Fi settings will disconnect all devices from your router. You have to reconnect them using the new settings. To learn how, click here. The steps below will guide you on how to change the Wi-Fi settings of your router. You can click here for the video tutorial. Access your Linksys cloud account. To know how, click here. NOTE: If you haven’t set up a Linksys cloud account, click here to know how to create, activate and associate your account to your router. 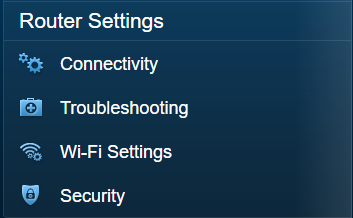 Click Wi-Fi Settings on the left navigation pane under Router Settings. Under the Basic tab, click Edit beside Wi-Fi Settings. Enter your desired Wi-Fi name and Wi-Fi password in the fields provided. To know the difference between the 5 GHz and 2.4 GHz bands, click here. On some Linksys Smart Wi-Fi Routers, Wi-Fi name is also known as Network name (SSID). Wi-Fi password is also known as Password. Setting your Network mode, Security mode, Channel width and Channel can also be done. Changing the wireless channel lessens the interference to your Wi-Fi connection. For more information, click here. Also, the available wireless channels may vary depending on your region. If you want to make any changes in the future, you can access your Linksys cloud account within your local network or remotely. To learn how to access your Linksys Smart Wi-Fi Router within your local network, click here.